Another historical link was built between the north-east of England, the Royal Navy and Vice-Admiral Collingwood at the end of April 2010. The Navy’s latest destroyer HMS Dauntless made her first visit to the Tyne in her capacity as adopted ship of the City of Newcastle. The City’s Lord Mayor, Cllr Mike Cookson, presented the ship’s commanding officer with a bottle of ‘Royal Sovereign’ Rum, named after Collingwood’s flagship which played a crucial role at the Battle of Trafalgar in 1805. The rum has been specially produced for the Collingwood 2010 Festival by the Northumbria Spirit Limited, based at Wylam Brewery near Heddon on the Wall and complements the already hugely successful Festival Ale. The specific local connection in the drink is the balance of base gold rum at 80 per cent proof cut with Northumberland Spring Water to the UK spirit strength of 40 per cent. Northumbria Spirit Ltd was formed in 2007 to reintroduce the distilling of spirits to Northumberland and Newcastle. Its range of traditional and fruit gins under the brand Jack Cain’s® are recognised by enthusiasts as premium examples of the products. Jack Cain’s Royal Sovereign complements the range with a Caribbean Oro Rum. 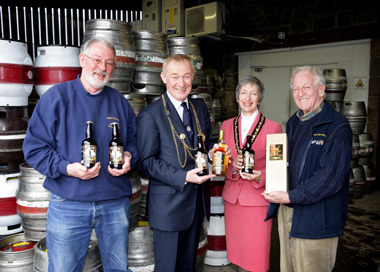 The Lord Mayor Cllr Mike Cookson and Lady Mayoress Mrs Dorrie Cookson, with directors of Northumbria Spirit directors, John Boyle (left) and Jim Golightly at Wylam Brewery.